It's been exactly a month since the French Culinary Institute's L'Ecole rolled out their bar menu. I'm always in the mood to dine at this modern (but not stuffy) French restaurant, run by the Institute's students and supervised by their instructors. The couple of times I've been so far has always proven to be a professional and gastronomically fulfilling experience, and this time was no different. My co-worker and friend, Leann accompanied me to sample this menu, which surpassed our expectations. 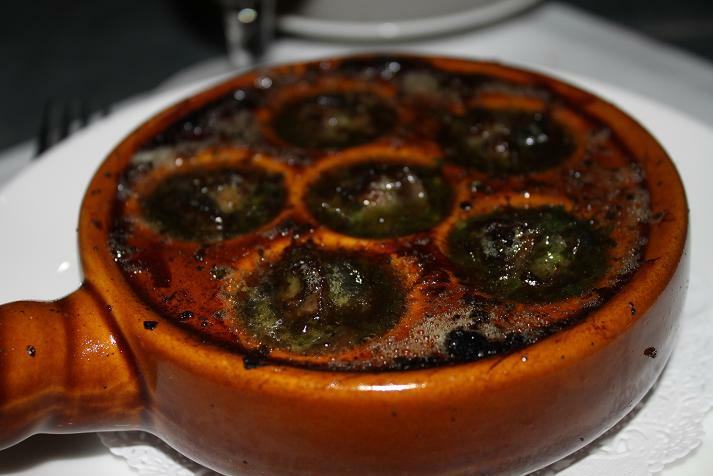 Escargot - A classically prepared version of this dish was a most welcome way to start things off. Resting in shallot, parsley-butter sauce, the escargot was an incredibly decadent prelude to our meal. The escargot was tender and not chewy or fishy tasting, which can sometimes plague this specialty. After we gobbled up the main parts of this dish, we continued to dip the freshly made French baguettes into the sauce. Pure yumminess! Goat Cheese Croquette and Salad - Our second appetizer was a must, as we both have a love affair with goat cheese. The croquette was warm and crispy on the outside, yet perfectly soft and melty on the inside. Its tanginess was offset by slightly bitter leafy greens, roasted Bermuda onions and sweet beets. I love beets in anything and a combination with the goat cheese was a match made in heaven. Moules Frites - What better way to enjoy timeless French cuisine than with an order of mussels and frites? I liked that L'Ecole's version was uncomplicated and familiar, the mussels floating in a traditional garlic, white wine, shallots and parsley sauce. The mussels themselves were meaty and flavored by this fragrant sauce. It goes without saying that we lunged for the frites and kept dipping them in the concoction even after the mussels were demolished. 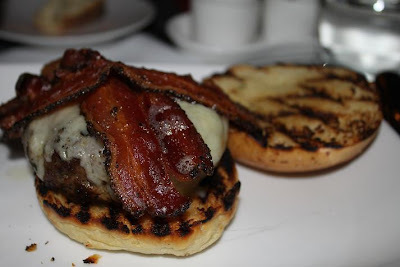 Gruyere Bacon Burger - Appreciating a nice, hearty burger, this one came on a beautifully grilled brioche bun. The meat was cooked to a perfect medium texture, leaving you with one juicy bite after another. Further dressed with thick-cut bacon that had a nice smoky essence and some tangy gruyere cheese, it was yet another item that hit the spot. Since the burger was substantial in size, Leann and I split it, creating the perfect portion. Dessert - Even though we were running out of room, we just couldn't ignore dessert and ordered the two things on the menu - a creme brulee and chocolate bread pudding. Both were delicious and very rich - the creme brulee was actually on the lighter side with a nicely solidified sugar crust that was fun to break. The interior custard was light and clean on the palate with a distinct vanilla aftertaste. 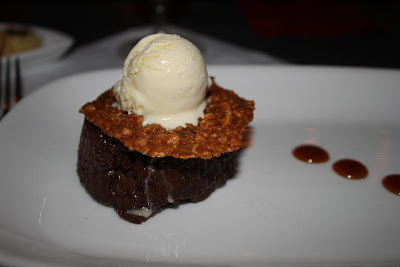 The chocolate bread pudding was a heavier dish, but given that Leann and I are both chocoholics, we didn't have a problem with it. Topped with a crunchy almond cookie and a scoop of simple, vanilla ice cream that added a nice juxtaposition in texture, this dessert presented a dramatic finish to the meal. Drinks - As I mentioned, Leann and I paired our food with beer. I chose the Rogue Mocha Porter that had a lot of body and a bittersweet malty flavor - it was a great winter beer - while Leann went with the Fire Island Frozen Tail that was also on the darker, richer side. Dutifully served by our bartender, we didn't feel neglected at all and our food was brought out in good time. 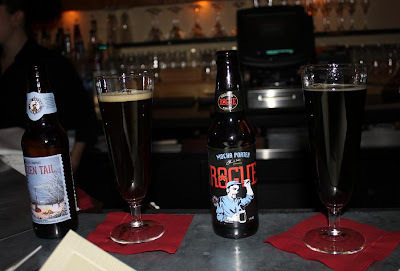 We liked the casual feel of the bar, and loved observing the goings-on of the restaurant in between. Also, remember that you have another week to take advantage of a free cocktail deal, when you mention "The Foodista" at the bar with any order. This offer expires on March 15th.